In the exhilarating conclusion to the internationally bestselling In the Land of the Long White Cloud trilogy, the spirited Warden and McKenzie clan continues its trials—and triumphs—in New Zealand and beyond.The great-granddaughter of Gwyneira McKenzie—who arrived in New Zealand as a naïve young bride in In the Land of the Long White Cloud—Gloria Martyn has enjoyed an idyllic childhood at Kiward Station, her family’s sprawling sheep farm in the Canterbury Plains. When her parents send word from Europe that it’s time for Gloria to become a proper “lady” by attending boarding school half a world away in England, Gloria must leave everything and everyone she loves most in the world, including her steadfast protector Jack McKenzie. Wrenched from her beloved homeland and struggling to fit in with the stifling strictures of British boarding-school life, Gloria has never felt more alone. 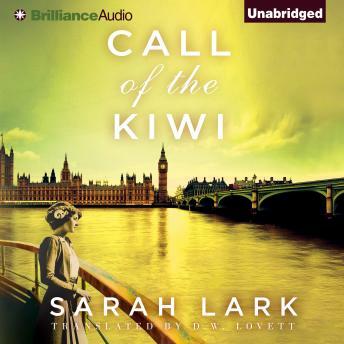 Upon discovering that her parents have no intention of ever sending her home, Gloria takes matters into her own hands and sets off on an adventure that will change her forever.A stirring coming-of-age tale of love, loss, endurance, shame, and redemption that takes listeners from the lush plains of New Zealand’s South Island to the bloody shores of Gallipoli, across Australia’s Northern Territory and beyond, Call of the Kiwi is a profoundly satisfying conclusion to the saga that has captured listeners’ hearts across the globe.